The Fuzz is what you call a fan of Gomez. A five piece band out of the United Kingdom (England moreover) and comprised of Ian Ball (Vocals, Guitar), Ben Ottewell (Vocals, Guitar), Tom Gray (Vocals, Guitar, Keyboards), Paul Blackburn (musician) (Bass), and Olly Peacock (Drums). Donâ€™t let this list fool you as these guys will make music out of just about anything they can get their hands on (or just whistle). How We Operate is a highly anticipated album, at least in this joint. The album starts off with a funky little jig that stays true to the Gomez form of a carefree, heart felt song building up to a power chorus. Suddenly you hear something. A low-pitched, raspy voice harmonizing in the backgroundâ€¦.Ah yes, The Fuzz remembers this voice and gets excited. Betcha thatâ€™s Ben Ottewell and heâ€™ll sing lead on the next one too. For those who donâ€™t know Gomez has three, yes three, gentlemen who sing lead on different tunes. How We Operate then flows into the second song and Ben wastes no time tearing it up. Then the chorus breaks. The Fuzz starts to bob and weave and you feel the album take control. You can almost picture the members of Gomez sitting around and enjoying the music flowing from them. The next few songs are just as good, if not better, and then it changesâ€¦ Itâ€™s time to relax. 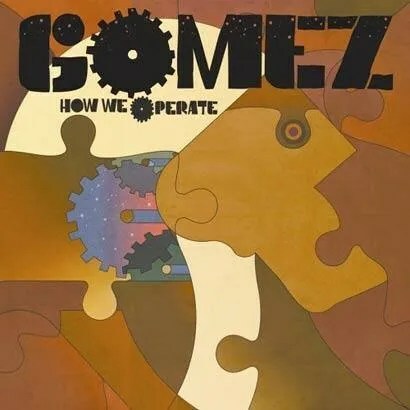 The middle of the album lacks the up beat pace of the first five songs, but is still worthy of the name Gomez. The mellowness of the following songs leads one to get lost in the background of the day. Every so often, you find yourself back in the moment chanting along and then you fade back away. For this reason, the album sets out well for the spring and summer ahead. The Fuzz pictures you putting How We Operate into your player just before lighting the grill on a cool summer night. The upbeat start will get your groove going and then let you become, wellâ€¦smooth. How We Operate is out on ATO Records. How We Operate finds itself 4 out of 5 Fuzzballs on the Fuzz Factor.